He claims he was sexually groomed by the king of pop. The premiere of the documentary "Leaving Neverland" at the 2019 Sundance Film Festival reportedly shed light on Michael Jackson's sexually abusive past. "Leaving Neverland" detailed the lives of two young boys, now grown men, who claim Jackson sexually abused them as children. Since the film's initial showing, a man named Michael Jacobshagen has come forward to claim that tell the late King of Pop also sexually groomed him when he was a boy. When Jacobshagen was 14, he toured with Jackson throughout Europe, appearing in the media many times during his time with the singer. Only recently has he detailed the truly disturbing nature of their shared encounters. Jackson allegedly nicknamed Jacobshagen his "Rubba Rubba" boy and shared a bed with him. “He was always asking me to sleep in his bed. I would say, ‘No Michael, I can sleep in my own suite’, but he was saying ‘Please, please... for Michael Jackson,'" Jacobshagen told the Sunday Mirror. He also claimed that the "Billy Jean" singer "grinded" on him when they were in bed together, he claimed. "When I slept in his bed, we wore just boxer shorts and he would put his arm around me and push his body to my body, like you would with a girlfriend," Jacobshagen explained. “He would put our bodies on each other and kiss me on the head and cheek. I woke many times and his hands were on me... one hand on the top of my legs and one hand around me." He said it was worse when Jackson was on medication. The meds would "disinhibit him" like "a man when he gets drunk," Jacobshagen claimed. “He’d pull me closer and be grabbing me more and kissing me more on the head and on the cheek, He would also stroke my hair." One time, MJ stripped naked in a Jacuzzi and invited Jacobshagen to do the same, according to Jacobshagen. He said no. He also said the pop star gave him a copy of "The Boy: A Photographic Essay," a book containing naked photos of young boys. Jackson said it was one of his favorite books and wrote personal notes to Jacobshagen in it, calling him his "Rubba Rubba friend" and "special friend." 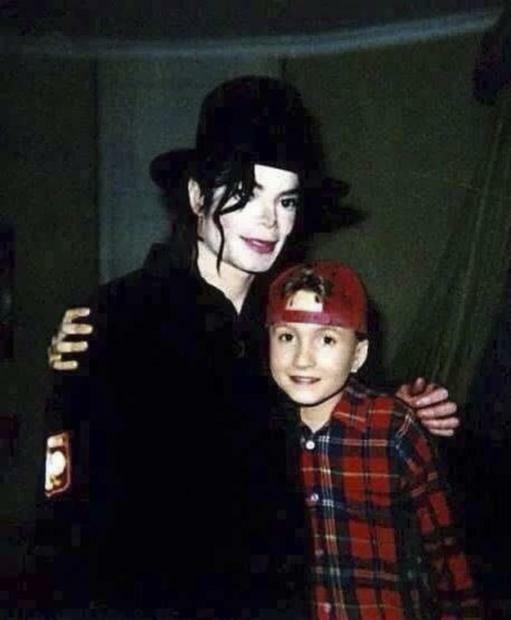 Although Jacobshagen said he was not "comfortable" with the way MJ touched him, he felt he could not say no. Jacobshagen, now 35, said he only realized how inappropriate MJ was with him as a child now that he is a father. “He overstepped the mark with me and with other children," he told the Sunday Mirror. “I’m almost the same age now Michael was when he met me. If I was to share a bed with a child, this would not be right. It is not normal and it’s not right." Jacobshagen said that he knows there will be backlash folowing his story's release but the truth needs to be told. Jackson's estate criticized the film, claiming it was just an excuse to make money off of the dead singer. RELATED: Was Michael Jackson Framed For Child Abuse To Cover Up Another Crime?